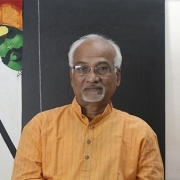 Painting Oil on Canvas | 18" x 18"
Painting Oil on Canvas | 30" x 40"
Painting Acrylic on Canvas | 42" x 42"
Painting Dry Pastels on Canvas | 12" x 12"
Raosaheb Gurav is one of the most celebrated artists in India. He can truly be called the connoisseur of modern contemporary art. Raosaheb was born in a provincial town of Maharashtra, known as Shirol. However, this did not stop him from achieving soaring heights; on the contrary it instigated an undying passion for arts which was inspired by the picturesque and rustic beauty enveloping his surroundings while he was a little child. Academically, he procured a Diploma in Fine Arts from Abhinav Kala Mahavidyalaya. Subsequently, he was appointed as an art teacher there. He has been in this field for almost four decades and has earned endless laurels throughout these years. His knowledge of art forms a broad horizon and he does not refute from using diverse mediums and textures to paint the panoramic views of the non-metropolitan city life which lounges in the tranquility of Mother Nature. He has organized numerous successful solo and group shows worldwide. Also, his paintings decorate the walls of many art enthusiasts.